THE REVIEW: About a month ago, when this year’s Oscar nominations were revealed, Selma received a grand total of two: one for Best Picture and one for Best Original Song for “Glory”. 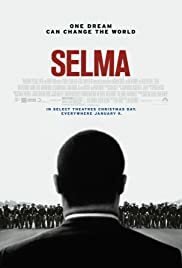 This elicited many complaints that Selma was snubbed for other nominations including ones for director Ava DuVernay and for David Oyelowo’s lead performance as Dr. Martin Luther King, Jr. While Selma may not have received all the Oscar nominations it deserved, it nonetheless remains a film that people should see and a film and a film that people ought to see. Yes, at the film’s core is the retelling of one part of the Civil Rights Movement. It focuses on the years 1964 and 1965 and the attempt to obtain unencumbered voting rights for African-American citizens in Selma, Alabama. It shows the struggles Dr. King and others went through, negotiations with President Johnson (Tom Wilkinson), and resistance from the Governor of Alabama George Wallace (Tim Roth). Most importantly, it depicts all of these events in a way that makes you want to watch it. Selma isn’t some documentary with talking heads, recounting what times were like back then. It is a dramatization that recreates that time and puts you in the place of the African-American people who were fighting for their lives and fighting for their rights. The film has received criticism for taking some liberties with the facts of the story and twisting them for the purposes of telling a more entertaining story. I’m no historian and couldn’t comment on any specifics. But as an audience member, what I care about is how the film makes me feel and whether or not it accomplishes its goal. And from that perspective, I believe it does. Because while Selma is a film about the Civil Rights Movement, it is also a film about perseverance, about standing up in the face of adversity, about standing up for what you believe. Whether white or black, conservative or liberal, North or South, Selma is a film that speaks to everyone. We see the challenges and hardships Dr. King goes through thanks to a tremendous performance by David Oyelowo. We feel the pain and suffering that the people of Selma go through thanks to the direction of Ava DuVernay and the, at times peculiar, cinematography by Bradford Young. The story of Selma is about a singular event, a 50-mile march between Selma and Montgomery, Alabama. But it’s because of an incredible piece of filmmaking and storytelling that we watch and listen and it can make an impact. THE TAKEAWAY: Nominated or not, Selma is still a powerful film that conveys an important message about perseverance and standing for what you believe in. I focused mainly on what the film is about and little about why the film succeeds in telling its story. Suffice it to say that all the elements that make the film are of the highest caliber and there are few flaws in the making of this film and telling of this story. Oyelowo’s performance certainly lends a certain gravitas and credibility for what the film tries to convey. For whatever reason you decide to see this movie, if you decide to do so, you will be entertained, shocked, inspired, and above all, moved.